The Meybohm Building at the Plaza is the first building of a planned new downtown development, the Plaza, for Columbia County. It is a new four-story building with 58,000 sqft of mixed-use space and will be the first new office space in the county for many years. In total the owner will be developing 6 buildings on the site that will be paired with a new central park and County Performing Arts Building. The Meybohm Building located on the site’s main entry will command views of the whole downtown once complete. The Meybohm Building will be the new home office for the Client who will act as an anchor tenant for the building. The site topography steps enough so that there is street access on two different levels. Both of the first two floors offer access to retail and restaurant spaces. The Meybohm Building offers an industrial mill look with plenty of brick and storefront windows. Various details including brick soldiering and rowlock courses, precast concrete banding, awnings, Juliet balconies, and verandas break up the large building façade. The building geometry is further broken up with EIFS panels and large overhanging roofs bringing a sense of scale and personality. Large display boards, exposed steel structure, modern finishes, and open floor plans bring a sense of modern design to a comfortable building shell. Maybe the most enticing feature of the design is the large overhanging roof on the fourth floor creating an enticing outdoor space. The overhang and associated walkable rooftop will act as the iconic welcome to the overall development. The fourth floor is completely dedicated to a rentable event space with a warming kitchen, bar/lounge, large seating area and the before mentioned covered outdoor space. Walls of storefront windows and the covered walkable rooftop provide views and daylight to the event space, allowing for up to 300 people to use the space comfortably. 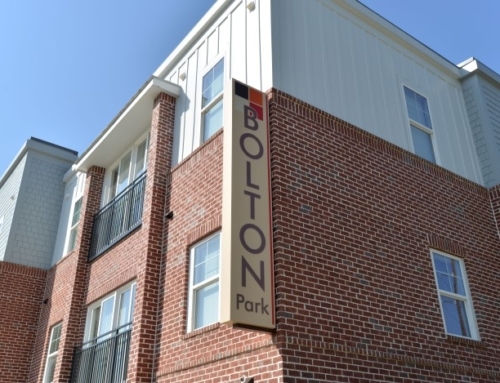 The walkable rooftop provides excellent views of not only the new downtown but also the existing park and amphitheater across Evans Town Center Blvd and surrounding vistas. The Meybohm Building will act as a very large and active feature for the client and the community at large. The industrial mill look creates a believable façade for the new large building, keeping it scaled the surrounding community. The modern design for the interiors brings an emphasis to the energy and vibe of the Plaza as the first piece to a larger puzzle.